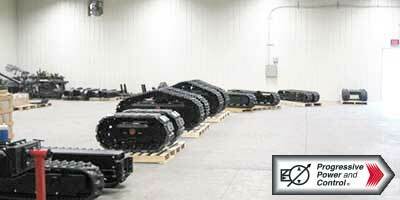 Progressive Power & Control sells hydraulic track drives made by Chermack Machine. Track drives can be added to any maching to increase it's mobility. 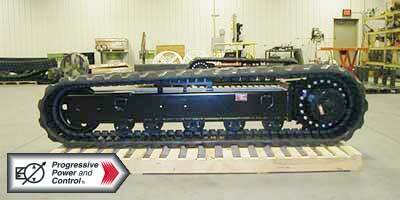 Chermack Track Drives easily adapt any machine to add tracks using adapter plates. Chermack adapter plates weld to the machine frame (not directly to the track tunnel) and then the track tunnels bolt to the adapter plates. Chermack Track Drives utilize compact two-speed planetary drives with highly efficient piston motors, internal parking brakes, and C/B valves from Nachi or KYB. Chermack track sprockets are made with through-hardened 4140 steel which is more durable and lasts longer life than case-hardened steel sprockets. Center sections offer expandable width for added stability. Weight ranges from 1000 lbs. to 20,000+ lbs. 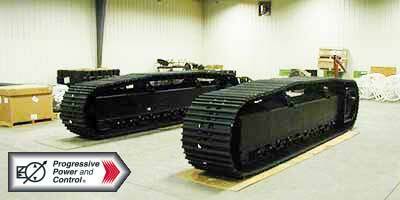 Non-motorized, towable tracks used to reduce ground weight.